Creamy Vegan Coleslaw - No Dairy and no added oil! 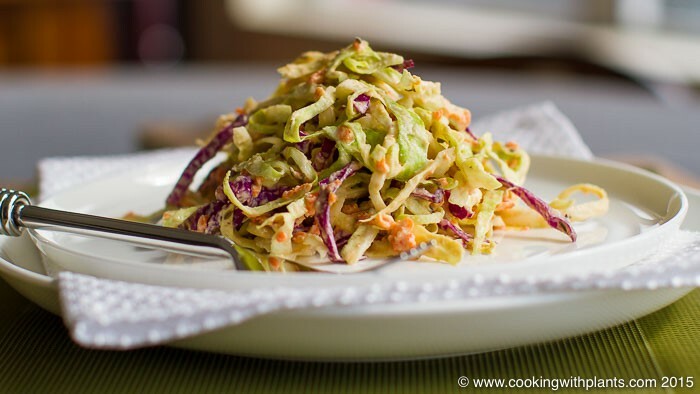 This is the best ever creamy vegan coleslaw! So quick and easy to make, and it’s dairy free and has no added oil. Healthy and tasty – and whole food plant based… YUM! This is one of my favorite vegan recipes and is great as a side or to have as a meal by itself. Place all of the base ingredients in a large salad bowl. Add all of the coleslaw dressing ingredients in a blender and blend until smooth and creamy (about 1 to 2 minutes). Add the dressing to the base ingredients and mix well. Sprinkle some cumin seeds over the top (optional) and serve. the Amazon link is for the USA isn’t it? Yes, but you should be able to switch to any country. What country are you in? I made this today and it’s very yummy! Thank you for this recipe, it’ll become one that I make regularly! Love your recipes! I would love to know the brand of the small white blender that you use in a lot of your videos. This is a real yummmie recipe. Thank you so much! wow..looks delicious..I want ti try this can I use apple cider vinegar? This cole slaw recipe is delicious!!! Had some leftover so added a chopped apple, some shopped celery and a handful of walnuts… yummy Waldorf salad!! Thank you for the recipe! Do you think the recipe will taste good if I use unpasteurized coconut vinegar instead of refined white vinegar? Thank you for this recipe! My whole family loved it! I’m the only WFPB so meals are usually for them with a separate meal for me. It’s wonderful to have recipes we can enjoy together. My daughter has requested I make it for her wedding. Thank you for all your hard work! How do almonds go and do you need to soak them first? For how long? Blanched skinless almonds would work. Depending on your blender it would be good to soak them first to make them extra soft and creamy when blending. Yummy! Just made it to put it over my BBQ Jackfruit sandwich. Thanks for sharing such lovely recipes.